You recently had your nose pierced and you’re starting to become concerned; wondering if it should look like it does. Is this normal? Or is this train starting to go off the rails? Infected nose piercings are unfortunately a very real possibility. No one wants to end up with an infection after having a piercing performed. However, infections in highly visible places, like your nose, can be even worse. It’s not like a belly button piercing that you can hide with a shirt until it’s all better. It’s one of the most prominent features on your face – and everyone can potentially notice it until you get it taken care of. This guide will help you figure out what’s up with your sniffer and how you can tell when a nose piercing has gone from okay to infected. It will also give you the know-how you’ll need so you won’t panic. Take a deep breath. We’ll get you through this. What Is A Nose Piercing Infection? What Causes Nose Piercing Infections? What Happens After A Nose Piercing Infection? Nose piercing infections are fairly common complications when having your piercing done. Everyone hopes they’ll dodge this particular bullet after their piercing is completed, but sometimes it happens. Here is what causes an infection after getting your nose pierced. As everyone knows, when you ﻿﻿get your nose pierced, a piercer puts a hole in your nose. Punctures like this are more likely to get infected than simple scrapes or scratches that you might get on your skin’s surface. That puncture wound goes in much, much deeper than a scratch does so there’s more opportunity for germs and bacteria to work their way into the wound. It’s not like germs and bacteria that sit on the surface of a minor scratch. Those can easily be washed away with soap and water during your everyday showers. On the contrary, when you have a deep puncture, like a piercing requires, that same bacteria can work its way deep into the wound. When you take a shower, it’s much harder for that bacteria to be rinsed out since it’s already in your body, not just on the surface. When the bacteria is allowed to stay, unchecked, in your body, that’s when the trouble really starts. It starts to multiply and can lead to an infection. Why do some people end up with nose piercing infections while others don’t? It hardly seems fair, does it? You got the same piercing so it stands to reason that you’d end up with the same outcome, right? Except that science doesn’t work that way. You might coast through your piercing while your friend ends up with a raging infection that has to be aggressively treated. There can be several reasons why one of you ends up with an infection while the other person doesn’t. One great way to cut back on your infection risk is to make sure your piercer doesn’t use a piercing gun. A hollow needle should be used instead because it is gentler on the tissue and it doesn’t cause as much damage. A gun may seem simpler and more desirable than waiting for someone to pull a needle through your skin. After all, one quick pump and it’s done with a gun. However, using guns actually ups your risk of infection, so you’ll want to stick with a single-use needle. To be honest, a potential minor infection to the nose piercing site could be the least of your worries if your piercer uses a piercing gun on you. Those guns are often impossible to sterilize fully. Bits of prior customers’ bodily fluids and tissues often remain behind in the gun’s nooks and crannies, even if the piercer tries to completely clean and sanitize it. That could potentially lead to far worse problems than a temporary infection – in the worst-case scenario, you could wind up with hepatitis or even HIV if a tainted piercing gun is used on you. Not only this, but nose piercing scars are much more common with guns than they are with needles. To guard yourself against infections and other medical problems, you have to be your own advocate. If a piercer says he uses a piercing gun, tell him you aren’t interested. Then start looking for another piercer who follows better safety procedures. Standing up for yourself now can help you prevent future problems so be fierce about your health. If you got your nose pierced right before you’ve planned a big trip to the beach, you’re going to be disappointed if you planned to do some swimming. You shouldn’t get too far in the water with a fresh nose piercing because of the risk of infection. Water can carry bacteria and, as we just covered, bacteria is bad news when it comes to a recent piercing. You’ll have to keep your nose away from water sources like the ocean, a swimming pool, and even your own bathtub while that nose ﻿﻿piercing is healing. Swimming pools can harbor a lot of germs and bacteria. Plus, they can be a double whammy for a new piercing because many of the disinfecting chemicals, like chlorine, that are used in pools can be irritating to your piercing. If your skin is irritated, the nose piercing will heal slower. Therefore, not only are you risking an infection, but you’re also increasing how long your nose piercing will take to heal if you go swimming in a pool, soon after you have your piercing done. For the first week or two after a piercing, if you have a deep tub at home you like to relax in, you might want to consider taking showers instead. People touch their faces throughout the day. It’s hard not to do it, and your nose is one of the most sensitive parts of your face. Whether your nose is itchy, runny or stuffy, most people are constantly touching it. While it may seem like an innocent thing to do, it can actually be extremely problematic. The simple act of touching a recent piercing can cause an infection. Think about how dirty our hands are during the day. We’re regularly touching surfaces – doors, desks, keyboards. Those surfaces often contain a lot of bacteria from people who touched them before us. If that bacteria transfers from our hands into our piercing, it can lead to an infection. That’s why your piercer will stress the importance of washing your hands before you touch your piercing. Obviously, that’s easier to do when the piercing is away from your face and covered with clothing, like with a belly button piercing. If you catch yourself touching your face throughout the day, try to pay attention to it. 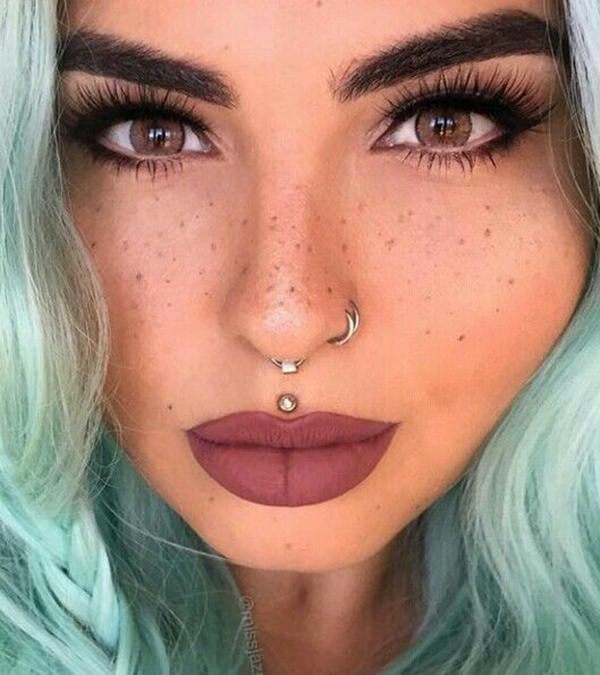 That’s one habit you should work on breaking if you have a recent nose piercing. If you choose jewelry that’s made out of a type of metal you are allergic or sensitive to, it slows how quickly your body will heal from the piercing. A slower healing time gives more opportunity for bacteria to set in. Before you tell your piercer what type of metal you want, think back to any other piercings you’ve had done. If you’ve had your ears pierced, try to remember if you had any problems with metals you used in your ears after that. If so, you should tell your piercer that you want to avoid that type of metal. Many people can’t tolerate nickel very well in their jewelry because it can lead to allergic reactions or allergies. If you want to ensure you’ll heal as quickly as possible, you might want to stay away from that metal. A lot of people have had good luck with surgical-grade titanium jewelry. If you have money to spare, you could also try gold jewelry. 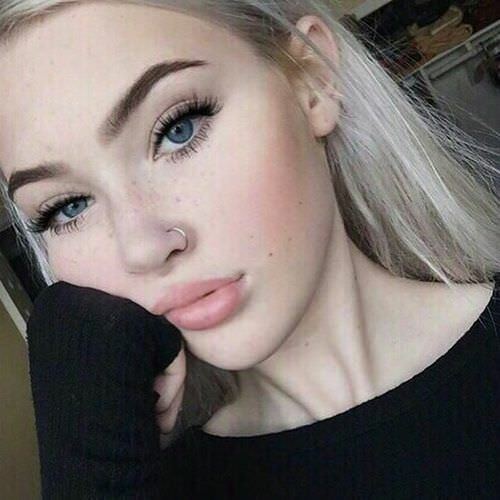 Sometimes your nose piercing can be healing on schedule and therefore your chance of infection starts decreasing. On the other hand, if you get an injury, even a mild one, to that area, your risk of infection/s goes up. You need to be careful with your new piercing and treat it gently to avoid any injuries. If you like to participate in sports, you need to use a lot of caution, especially if they are contact sports, like basketball. For the first couple of weeks, you might want to consider swapping your basketball out for a tennis racket. You won’t run the risk of getting jostled and bumped by your competition if they are on one side of the court and you’re on the other. Inserting nose jewelry incorrectly can also cause damage to the surrounding area, so ensure you're extra careful with this step. After your piercing, your piercer will tell you or hand you instructions as you dash out the door, still a bit dazed by what has just happened. How well you follow these instructions can be a determining factor as to whether an infection develops or not. Aftercare instructions aren’t difficult to follow, so why do some people have trouble sticking to them? For various reasons, including being too busy, forgetting about it or simply being too lazy to be bothered to take a few minutes a day to keep your new piercing clean. The instructions don’t take long to follow and if you follow them strictly, you might end up infection free. It’s worth the extra effort, so if you find your commitment starting to waiver, look up pictures of infected nose piercings online. Those images might give you the extra motivation you need to keep your piercing clean. It would be nice if everyone was able to tell with a simple glance if their nose piercing was infected or not. Yet, unfortunately, that’s not always the case. It can be tricky figuring out if a nose piercing is simply irritated or if a true infection has set in. Here are some of the things you could expect to see in an infected nose piercing. You can expect redness on your nose after you’ve had it pierced. That’s a common side effect of having a hole put through your nose. Although, if you notice the redness isn’t going away or if you see any red streaks that seem to branch out from the piercing site, you’ll want to up your aftercare commitment just in case it’s infected. 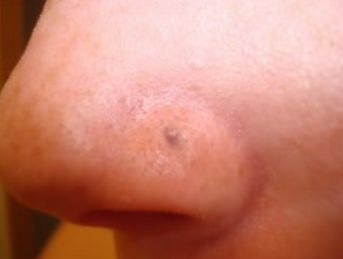 If you see a strange nose bump or swollen area around your nose piercing, it could mean that an infection has settled in. Infections tend to hurt, sometimes a lot. If your pain level seems to be going up instead of down, something’s probably not right. Try to remember if you’ve snagged your nose jewelry recently. That could account for the higher pain level. If nothing comes to mind, keep a close eye on it for any other sign that an infection might be developing. If you notice a ﻿﻿bump ﻿on or around the nose piercin﻿﻿g, it’s a possible sign of infection. If the bump seems a bit oozy, or if it is red, hot to the touch and/or painful, it’s even more likely to be an infection. You should take any bumps you find seriously. Even if they aren’t an infection, they aren’t exactly the look you were going for. If you have any doubts about what it is, ask your piercer. You can have some discharge from your nose piercing in the first week or so. There’s no need to sound the alarm if you see that. However, if it seems to be increasing in volume and frequency, and the discharge has morphed from clear to yellow or another color, an infection is most likely. A funky smell from the discharge is another warning sign of infection. One way to gauge whether a nose piercing is infected is to look at the timeline. If you’ve just had your nose pierced in the past couple of days and there is still redness, pain, discharge, and swelling, you shouldn’t get overly anxious that it’s infected. All those things can still be present in a nose piercing for a week or so after the procedure. An example of when you may need concern yourself is if you notice the pain level and redness had started to fade for a couple days, before coming back with a vengeance. This might mean that your piercing has taken a turn for the worse. The first thing you should do is stop irritating the infection with anything you might be putting on your skin. If you wear makeup, like foundation or concealer, you need to skip putting it on the piercing site. It can be tempting to load up the foundation on that area so you can hide what’s going on and still look normal to the outside world. Nevertheless, if you’re putting makeup on the piercing site, you’re really throwing fuel on the fire. You should also make sure to skip any face lotions or creams on that site. The next step is to begin cleaning the infected area. Make sure you wash your hands thoroughly with plenty of soap and water. You should be doing more than just a quick rub and rinse. Take your time and make sure you’re really scrubbing those hands up well. When it comes time to dry them, use a clean paper towel since cloth towels can be a great hangout for bacteria. Use a Q-tip dampened with warm water to gently begin cleaning any crust from the piercing site. Once that crust has been kicked to the curb, take a cotton ball dipped in a salt water solution. The solution is easy to make – just take about one-fourth of a teaspoon of sea salt and add a few ounces of super hot water. Before you dunk your cotton ball in the hot water, give it a couple minutes to fully dissolve the sea salt and let the water cool a little so you don’t scald yourself. Once your cotton ball is wet, squeeze it out a little to remove the extra water. Then firmly place it against your piercing site. Keep holding it onto your nose until the cotton ball cools off. Then you’ll throw that cotton ball away and do the exact same thing with another one. Keep up this process until you’ve had a wet cotton ball against your nose for a minimum of five minutes. The salt water is good for your infection and the warmth of the water will help drain out any pus or discharge that is building up. After you have finished with the cotton balls, rinse the piercing site with some clean, warm water and pat it dry with a paper towel. You should continue to do this twice a day. You can try this homecare as long as the infection doesn’t appear too severe. If you notice your infection seems to be getting worse, you should call your doctor for an appointment. You’ll be able to tell it’s getting worse if the pain level is increasing, it appears to be more swollen, any red streaks begin to form or if you develop a fever. A fever indicates the infection is spreading throughout your body and that means it’s no-longer just a nuisance – it could potentially become dangerous to your overall health. 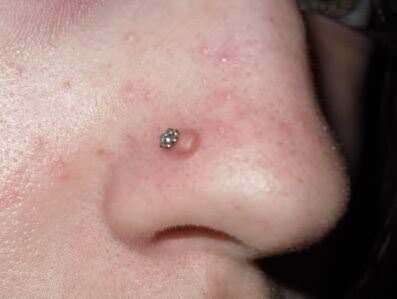 Many nose piercing infections heal well, after receiving the proper treatment. If you have to visit the doctor and are prescribed an antibiotic, make sure you take every dose of the medicine you are prescribed. Even if your infection seems to clear up, don’t stop taking that medicine. If you quit before the course is through, your infection can rebound. It can be harder to treat if it becomes resistant to that first antibiotic. It can be a pain to fight infections, but with patience, you’ll get through it. After you’ve treated the infection, make sure to continue to watch for any signs the infection may be coming back. It’s always best to be vigilant so you can spot if something does seem to be a problem. The sooner you see it and try to treat it, the better off you’ll be. Making an attempt to avoid injuries to your piercing site will help you dodge future infections. If your skin gets scratched or pulled, it can create a new wound or scratch that can allow bacteria to settle back in. That can open you up to a new infection. Therefore, try to treat your skin gently to avoid this possibility. You should also avoid cheap, poorly-made jewelry if you want to dodge future infections. They are often made of less desirable metals like nickel that can cause allergic reactions. The more irritated and raw-feeling your skin is, the more you might want to scratch it. Scratching wounds can compromise your skin, allowing bacteria to get in. That might lead to an infection. Plus, cheaper jewelry might bend or break more easily, which could lead to additional scratches. If you’re the type who likes to do everything as cheaply as possible, you should rethink your jewelry choices and consider spending a few extra dollars to go for quality. Sometimes it’s better to pay more just to avoid complications. Nobody wants an unattractive infection on their face because they wanted to save a few dollars. Most people who get their nose pierced don’t end up with infections. If you follow your aftercare instructions and do your best to keep your hands clean, you should be fine and not need to worry too much. If you do end up with an infected nose piercing, do your best to keep your chin up until it’s gone. It can be disheartening when it comes to your appearance and overall mood, but with a little work, your nose will be back to normal in no time. When Can I Change My Nose Ring? Nose Piercing Price Guide – How Much Do They Cost? Nose Piercing Pain – How Much Do They Hurt?